Does It Mean A Sale is in Your Future? A good sign? Not exactly. Lots of buyers out there? Possibly. Are you making a safe bet? No. Heady stuff. Such a call changes your whole perception of what the future might bring. Is this the yellow brick road you are counting on to find your pot of gold? Let’s pull back the curtain and find out what’s happening on the other side when you get a call like this. 1. Who is making so many phone calls? Answer: Brokers, (who agent (like a real estate broker) main street-sized companies), M&A advisors (who select mid-market sized companies to represent) and Investment Bankers (who are selected by large businesses to represent them) have telemarketing teams looking for qualified leads. Those are probably recent MBA grads you are talking to. Calling you is their training program: a trial by fire. 2. What’s a qualified lead to them? Answer: I know there will be many who beg to differ and not all firms make these calls. Of the ones that do, their goal is to identify owners willing to pay a retainer to ‘package up’ thebusiness so it can be ‘put on the market’. 3. But do they have qualified buyers who might want to buy my company like they suggest? Answer: Yes and no. If it’s a business broker on the other end of the line, they’ll provide you a valuation, for a fee and then make some suggestions about how you could increase that valuation and then get paid if they find a willing buyer. The M&A advisor will screen your business, possibly agree to represent you (after you pay that retainer). M&A firms will look at hundreds of companies like yours and select the few (9 out of 100) they know their buyers will want to acquire. They discard any company that doesn’t pass their screen. 4. So those calls are not offers to buy my business? Answer: That’s right. They want to get you on their list of leads. They know nothing about your business whether it’s successful or not. They can’t see into your operations or your financial statements. And they certainly can’t evaluate whether your business would be of interest to a buyer. You are being invited into their product funnel. You probably have a product funnel in your business development system too. That’s how these firms find their prospects willing to pay them a retainer and possibly become one of the companies in their portfolio that will earn them a success fee if they find a buyer that completes the deal. 5. So I should not take the calls and throw those invitations in the round file? Answer: Not entirely. You now might be able to ask more questions to get better informed about the purpose of their call. Ask them how they selected your business, what the steps are to become their client, what they can and can’t guarantee by working with you and what their process is to select the companies they present to buyers. Their answers will tell you a lot about how seriously you should take their “offer”. But beyond your response to these phone calls, you need to ask yourself an entirely different question. If these calls have given you a sense of security about one day being able to cash out and fund your next act then chances are that secure feeling may have just been rattled by what you have learned in this article. 1. If financial security is important to me and I really want to make sure my company continues to thrive whether I still own or not, then what do I need to do next, as soon as possible, to make certain I could sell my company when the time comes? Recognize that the right time to sell is not when you are ready to retire or turn 65 or when the kids are ready to take over. Don’t think of your company as if you are an employee in it. If you want to leave something to your kids, capture the value from your business and leave it to them in your will. Your company could become a wealth generating asset: something you sell when the value has appreciated. hink of your business as you would a stock in your portfolio: If you buy a stock, what’s your goal? To make more money than what you spent buying it and put the proceeds into your nest egg, right? You buy at $100. You set a goal that you want a 20% return on your money. On paper you may own an appreciating stock… but it’s not guaranteed until you sell it. You tell your broker to sell when the stock price goes to $120. That’s when you’ve locked down your return. Now you have a nest egg. 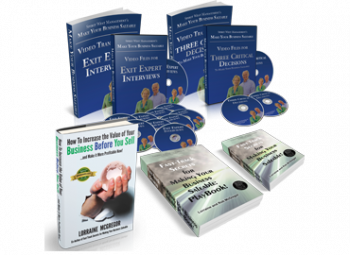 Your business could become an asset that someone is willing to pay you for. Just take the 2-4 years to make the changes that put your company at the front of the line on the M&A advisor’s selection criteria. The right time is when a buyer is looking for the type of business you have and you have turned into a transferrable and saleable asset. s, that’s right. Timing is everything and age has nothing to do with the right time to sell. In fact, that’s probably the worst time you could think of selling. 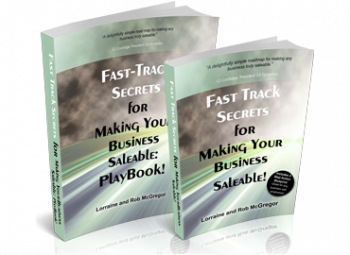 The right time is when the company is still growing, you are not material to the business’s current or future success and the ‘know-how secret sauce’ and procedures are locked down in your IT systems and training programs constantly being updated. These are some of the factors that turn a company into a saleable asset. So think about it. You’ve saved your salary and dividends. That’s yours. The retained earnings belong to the company, not you. 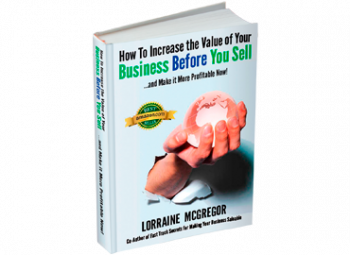 There is more ‘value’ locked away inside your business. But you have to sell some or all of it to get into your pocket. Is there enough in your nest egg to finance your future? To get any greater return than what you have saved to date, you have to set a goal and be ready when you get the next phone call so you can push the sell button. That’s how to get that financial security you thought you already had. That your family is counting on for you to provide. That’s how to get into the 10% of owners who actually are able to sell. Wishing you a saleable business.